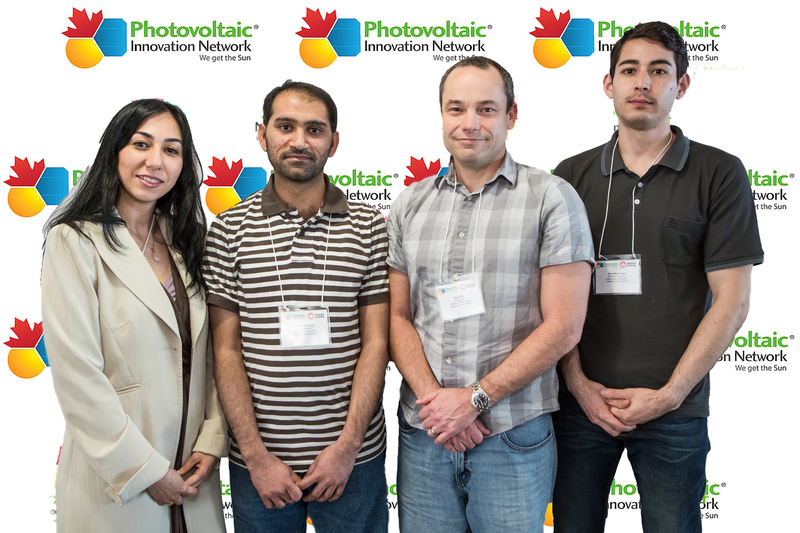 left to right: Elham Rezasoltani (PhD student – Université de Montréal), Hafeez Anwar (PhD student – Dalhousie University), Professor Ian Hill (Project Leader – Dalhousie University), and Jon-Paul Sun (MSc student – Dalhousie University). ::Download Scientific Description:: ::Project Researchers and Highly Qualified Personnel:: ::Project Progress Summary:: The major appeal of organic solar cells is that their fabrication methods and materials are very cheap. However, currently that low cost is almost always accompanied with a low efficiency and this has several drawbacks. 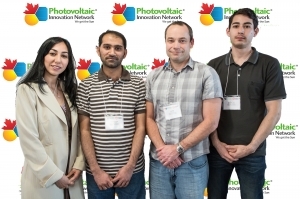 This project seeks to increase the efficiency of organic solar cells while still utilizing low-cost materials. We propose to do this by replacing the organic acceptor material in such cells with an inorganic metal oxide material that can theoretically do a better job owing to its superior electrical characteristics. This arrangement is called a hybrid solar cell and these cells should theoretically be more efficient than their fully organic counterparts. In practice, however, their efficiencies have been as much as ten times lower than the best organic solar cells. Hybrid cells have a poorer performance because they typically produce much less electrical current than expected. This points to issues with exciton dissociation at the donor/acceptor interface and charge extraction. Exciton dissociation is affected by the alignment of energy levels in the organic donor and inorganic acceptor materials while charge extraction is affected by the ability of an electron to reach an electrode without first falling from its excited energy state. 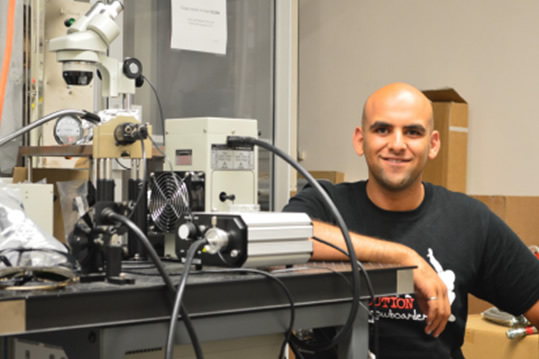 Figure: Project 4 HQP Yousef Alatter, at Dalhousie University, is working with solar simulator apparatus used in solar cell characterization. The goals of this project are to fabricate such hybrid devices, and correlate their performance with advanced scientific techniques like ultrafast femtosecond laser spectroscopic studies and photoelectron spectroscopic measurements of the donor/acceptor energy levels. Furthermore, interface engineering techniques will be used both to alter the energy level alignment of the donor and acceptor materials and also, to improve the interface quality. By doing so, we hope to greatly enhance the electrical current of hybrid devices, and therefore, the efficiency as well. Figure: A dramatic roughening of the surface topography upon Ca doping of ZnO was studied using atomic force microscopy. These ridges are advantageous, to a point, as they increase the surface area of the donor/acceptor interface, increasing short circuit current with increasing Ca fraction. Update 2015: The field of hybrid organic/inorganic solar cells has undergone tremendous changes since the original research proposal was written in 2008. At that time, the proposed research focused on developing an understanding of, and methods to reduce, exciton and carrier interfacial recombination in organic/inorganic solar cells. In particular, we proposed to study systems consisting of a polymeric organic donor material, and an inorganic metal oxide acceptor. These systems were to be studied by device fabrication and characterization, photoelectron spectroscopies, and ultrafast laser spectroscopies. The proposed research involved interface engineering, for instance using self-assembled monolayers, and inorganic oxide engineering, through stoichiometrically mixed metal oxides to control electron affinities. Since that time, solution-processed small-molecule-based materials have been shown to have comparable, and sometimes advantageous, properties compared to polymers. We responded to this development by adding tasks to study small molecule materials. Over the past few years, the field has been revolutionarily changed by the advent of highly efficient solution processed hybrid organic/inorganic perovskite solar cells. These technologies were not included in the original proposal, but we responded by adding tasks to investigate this exciting sub-field. Specifically, we have added tasks to investigate low-cost, sustainable electron and hole transport materials to replace the fullerenes and spiro-OMeTAD that are typically used in these devices.